It does happen. After all, we are what we are. Above all, human and highly imperfect, motivated by an infinity of whims and desires and concerns. Sometimes, what seems to be the right thing to do—restitution—is not perceived that way at all by the person who should be the happy recipient of such good fortune—the successful claimant. In this case, as reported by Bloomberg News, Thomas Hemer, a current resident of the state of Nevada in the United States, lost a lengthy legal battle against the Conference on Jewish Material Claims against Germany, Inc., (Claims Conference) over a set of Egyptian antiquities which his grandfather, a renown Egyptologist by the name of Georg Steindorff, had been forced to sell after the Nazis swept into power in Germany. Out of concern for the safety and preservation of his precious collection of antiquities, Steindorff agreed to sell his delicate cargo to the University of Leipzig. That being what it is, the sale, under any circumstance, was a forced sale. In other words, Steindorff’s heirs were—and continue to be—the rightful heirs to a wrongful removal of their cultural property during the Nazi years. Fast forward to this past month of legal wranglings and decisions in Germany over the Hemer/Steindorff hoard of antiquities housed at the University of Leipzig. The Claims Conference, being what it is and doing what it must do, felt obligated to assert its claim over the cultural goodies which had been the subject of that forced sale in the late 1930s, regardless of Mr. Hemer’s feelings about it. How weird can this be? This is not a novel occurrence since over the past decades Jewish organizations and their constituents have locked horns over the recoveries of looted assets and whose interest must prevail. Now that the court decisions have come in, the Claims Conference is the club-footed current possessor of these antiquities which should have been in Mr. Hemer’s possession. That’s the point: he does not want them and he wants the University of Leipzig to have them so that they can continue to be studied and researched. Think what you may here but there must be a rule of exception by which the claimant’s desires must be respected and abided by. After all, this is not like international law where the rights of nations supersede those of individuals. Must the interests of Jewish organizations supersede those of individual Jewish claimants? I should hope not. The best possible way out of this Gordian knot is for the Claims Conference to restitute the items to Mr. Hemer and for Mr. Hemer to return them to the University of Leipzig if that’s what he wants to do. If the Claims Conference decides to sell the objects or to invoke even a partial return, it’s slipping down the slippery slope of no-return. Hopefully, there is more to this story than meets the eye and has been revealed as of yet. On the face of it, though, until proven otherwise, another measure of justice needs to be meted as outlined above. A gentle reminder here: ironically and ever so gratefully, at a time when not a single Jewish organization expressed any interest or desire to invest in the creation of a looted art database, the Claims Conference did step in, threw its hat in the ring and agreed to launch into an adventure that has changed the face of looted art research forever. Go to http://www.errproject.org/jeudepaume. At the outbreak of World War II, the world-famous New York-based art gallery, Knoedler’s, had a branch in Paris—in fact, it had two offices there, one at 22, rue des Capucines, and the other at 17, Place Vendôme, where it was neighbors with the firms of van Cleef, Graupe and Seligmann. In 1941, Knoedler’s Paris sold a portrait of a woman entitled “Source,” painted in 1723 by François de Troy to the "Kunstsammlung[en]der Stadt Düsseldorf." The item was picked up at the rue des Capucines address by the Schenker forwarding and transport organization. Pick-ups usually occurred on Wednesdays and Friday afternoons. 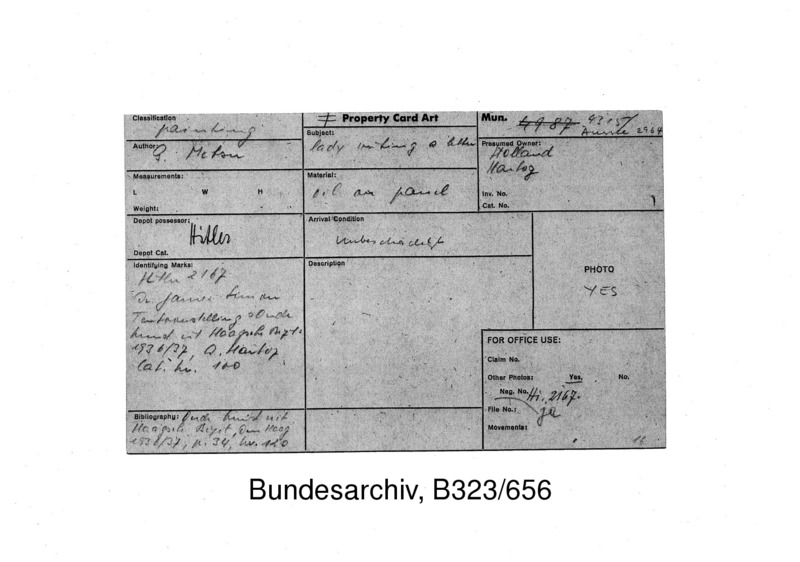 According to documentation produced by the Office of Strategic Services (OSS), the American firm of Knoedler’s sold “works of art to German museums during the [German] occupation [of France. ]” The leaders of the Schenker firm in Paris, Willi Bleye and Hans Wiederhold, worked closely with personnel from the German Embassy at its rue de Lille mansion and specialized in the transport of art—mostly plundered—to the Reich. No one, to date, has held Knoedler’s accountable for its wartime role in Paris. “Like the Holocaust itself, the efficiency, brutality, and scale of Nazi art theft was unprecedented in history. Experts have estimated that as many as 600,000 paintings were stolen, of which more than 100,000 are still missing. When furniture, china, rare books, coins, and items of the decorative arts are included, the numbers swell into the millions. At the Washington Conference, we obtained a consensus from 44 countries on a voluntary set of Principles on Nazi-Confiscated Art, which profoundly changed the world of art. The guidelines have important moral authority. They called on museums, galleries, and auction houses to cooperate in tracing looted art through stringent research into the provenance of their collections. Leeway was to be given in accepting claims. An international effort was to be made to publish information about provenance research. A system of alternative dispute resolution was to be considered to prevent art claims from turning into protracted legal battles. Since none of these principles was legally binding, one may legitimately ask whether anything has really changed. The answer is unequivocally yes. Interestingly enough, the estimated number of looted paintings still to be recovered has now increased significantly since the December 1998 Washington Conference on Holocaust-Era Looted Assets, from 125,000 to 600,000, and, if one adds all sorts of other things into the mix, we might reach a figure into the millions. Progress has indeed been made. Ambassador Eizenstat truly believes that something has changed since late 1998 as a result of the enactment of the Washington Principles. He is correct to point out that major auction houses conduct provenance research on works that they offer for sale. At this point, the expression “major” refers to only two houses: Christie’s and Sotheby’s. No one has yet asked DePury, Bonham’s, Butterfield’s, Artcurial, Lempertz, and hundreds of other auction houses if they are applying themselves as dutifully as the two leading global auction houses in order to ensure that stolen art does not come to market through their good offices. In other words, the global private art market is like a gigantic sieve with thousands of holes in the mesh. Christie’s and Sotheby’s are able to plug their particular part of the sieve while looted works are passing through all of the others. Where is the policy that plugs those other holes in the sieve? Ambassador Eizenstat then refers to the “creative web ‘search engine’” developed by the museum associations in the United States which lists more than 27,000 objects with uncertain or incomplete provenances. Granted, the site has existed now for some time under the odd acronym of NEPIP. However, since the Museum associations do not release any statistics on how many ‘hits’ have resulted from consulting NEPIP whereby potential claimants found their missing cultural possessions there, it is difficult to imagine how there have been “hundreds of artworks returned to their rightful owners.” The United States has, by far, one of the worst track records in the world when it comes to restitution of looted cultural property. Perhaps, Ambassador Eizenstat was alluding to the repatriation of looted antiquities by American museums which, in some cases, have consisted of wheelbarrows full of illegally-excavated objects. Truthfully, it is difficult to count to 30 when it comes to the number of artworks actually physically restituted by US museums to their rightful owners. There is also the likelihood that, unbeknownst to us all, hundreds of objects have been the subject of “settlements” reached by US museums whereby claimants have been obliged to accept some form of financial compensation in return for allowing title to their stolen object to remain with the current possessor. Clarity is needed here. In sum, after more than a decade since the Washington Conference of December 1998, the only notable accomplishment that Ambassador Eizenstat should report is that the two leading global auction houses which are both based in New York—Christie’s and Sotheby’s—are enforcing well-hewn internal mechanisms to identify and prevent looted art from reaching the open market and they are working diligently to withdraw suspicious items from their sales. To date, there are no central looted art databases to be consulted, there are no international mechanisms put into place by which art ownership disputes can be resolved to everyone’s satisfaction, and that includes both claimants and current possessors. There have not been significant changes in the laws of nations where stolen objects are currently located, which would permit swift justice to be meted for an unspeakable theft tied to an unspeakable crime of genocide. There are no institutional efforts put into motion which promote historical research and documentation into the losses of countless objets d’art and their recycling during and after the war through private and public hands where such research would be of immense benefit to the public, as well as to specialists in the art trade, art history, museum science, international law, and related fields. To date, there is an absence of coherent public policy pertaining to the location, handling, and return of looted cultural property in all countries where such property is located, despite the 1954 Hague Convention and other international pronunciamentos that provide ethical and legal guidance to effect such returns. In fact, the tide has even turned against claimants as museums, private owners and even national governments respond more assertively to requests for restitution by using a complex array of offensive tools made available to them by the legal system of their respective countries which is by definition designed to protect the current possessor and to eliminate long-standing claims for stolen objects, regardless of the circumstances under which the objects were stolen. Progress is elusive. 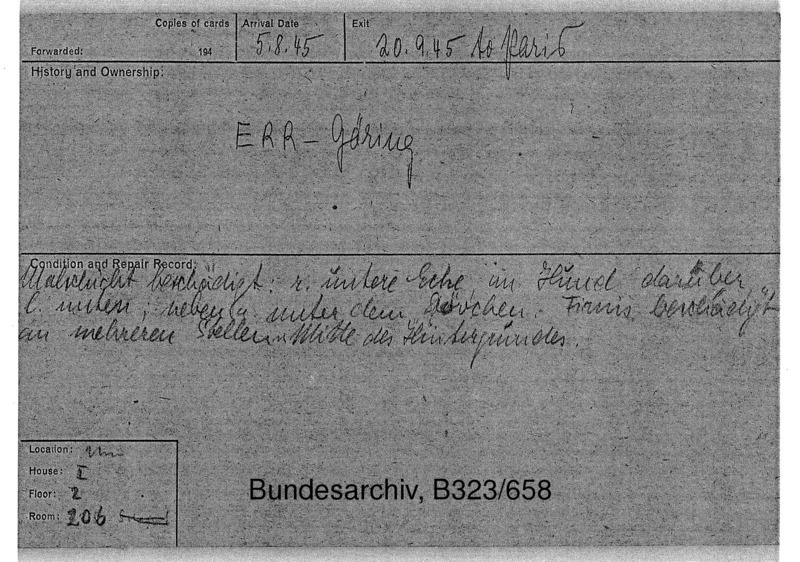 However, in order to avoid the label of “Debbie Downer” (a true Americanism depicting a chronically sour individual who can't see any light in any situation), one should also applaud advancements in the critical understanding of Nazi plunder and the increased access—everything is relative of course!—to archival materials. Much has been done in this growing field since 1998, which isn’t saying much, but there is progress. The recent announcement of an “international research portal” which brings together resources from a dozen or so State archives in North America and Europe is a major step forward, albeit a limited one since the portal consists mostly of a web-based guide to building a coherent research plan. Last but not least, we are keeping our fingers crossed that the European Shoah Legacy Institute (ESLI), established as a result of the June 2009 Prague Holocaust Era Assets Conference will provide us all with some badly-needed leadership in an area that has been so sorely neglected for so long—the documentation, identification, location, and restitution of cultural assets looted during the Third Reich. 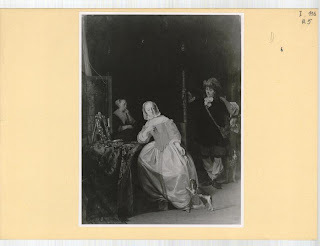 In September 1944, the Navy Censorship office in New York notified William Burke, of the Frick Art Reference Library, that a group of 30 paintings coming through Caracas, Venezuela, had been offered for sale to an art dealer in New York. At first blush, the list consisted of a high-powered compendium of major European Old Masters (Tintoretto, El Greco, Tiepolo, Rubens, Annibale Carracci) and a handful of 19th century masters (Lawrence and Manet chief among them). A second look at the list would make anyone wonder if these paintings were for real or not owing to their valuations. On the low end you could get a “Landscape” by Albert Cuyp for 375 pounds sterling. On the high end, El Greco’s “Virgin Mourning the death of Christ,” would cost you a hefty 22,000 pounds sterling. An expert with the Roberts Commission evaluated the list and his conclusions have withstood the test of time: the paintings were either copies of originals hanging in museums, or they were misattributed, or else they came from obscure, heretofore unknown collections, because many of them could not be located in the extant art-historical literature. For those he could find, the originals were in established European collections. The main concern at Navy Censorship and the Roberts Commission was that, for those paintings valued in excess of 5000 US dollars, a special permit would have to be obtained through the Federal Reserve Bank of New York in order for the works to enter the United States legally. This import restriction had been put into place in the early days of the Second World War to allow the US government through its Customs Bureaus to vet incoming items for any sign of suspicious origin (read, looted). 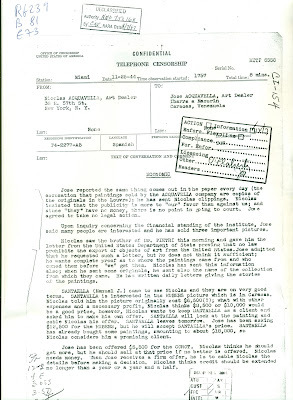 This September 1944 Navy Censorship document typified the nature of raw information streaming into wartime New York and Washington. Its use value could be viewed as marginal due to the lack of information that it contained on the works themselves--no sign of previous ownership, unknown consignor in Caracas. But, when confronted with a later piece of intelligence, the Frick document began to make more sense. 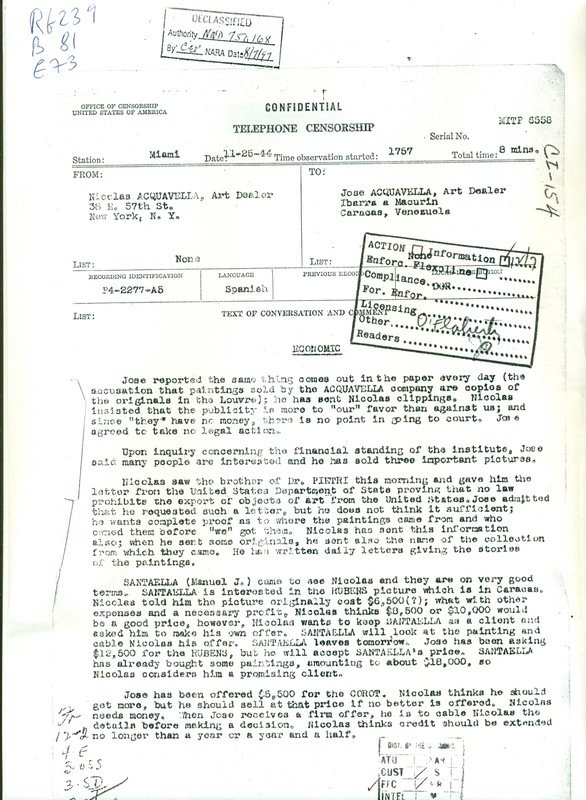 On November 25, 1944, the US Office of Censorship intercepted a telephone conversation between Jose Acquavella in Caracas and Nicolas Acquavella, an established art dealer on 57th Street in New York. During that conversation, Jose and Nicolas expressed anger over news reports that the paintings sold by their New York gallery were copies of originals hanging in the Louvre in Paris. Although most probably true, the clincher to the story is that one of Nicolas Acquavella’s clients, Manuel J. Santaella, a Venezuelan politician, had expressed interest in a painting by Rubens which Nicolas Acquavella was selling for about $10,000. However, the painting was located in Caracas under the care of Jose Acquavella. Coincidence? One of the paintings on the September 1944 Navy Censorship list was by Rubens and titled, “The Adoration of the Magi,” at a value of 15,000 pounds sterling. 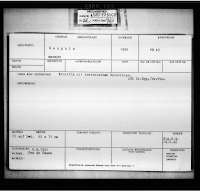 Although the two American intelligence documents may not be directly connected, the coincidences force us to consider that there is a relationship between the September 1944 reporting of the list of 30 paintings coming through Caracas and the late November 1944 conversation between the Acquavellas. Many plundered families in Europe of middle-class origin had acquired copies of works produced by known and lesser-known artists in part as a status symbol, in part as a way of expressing cultural preferences, in part because these works were far more affordable than the originals. Those works, together with victims' household goods, were summarily confiscated by Nazi authorities and sold at auction across Nazi-occupied Europe. The fact that 30 paintings, even if all were copies, were being offered for sale to a gallery in New York via Caracas, was a good illustration of the extent of wartime trade in works of art coming from Europe, regardless of their pedigree and museum-worthiness. As we have seen time and time again, good copies of original masterpieces were never frowned upon by museums, as witnessed in Buenos Aires. Thus, the trail of missing works coming from Europe could actually lead us either to a Latin American museum or to the lower-tiered art market in New York. The plunder of culture is a crime against humanity. And the right to culture is a human right. Since the dawn of ages, men and women have defined themselves in part by leaving cultural and aesthetic tracks behind, a reminder of their identity as humans. It is a fitting and inalienable human trait to shape for others to see and judge and appreciate what we call “culture”. Its forcible removal and attempted elimination through misappropriation and destruction as during the Holocaust are therefore a crime against us all, as individuals and as members of collectivities and groups defined by language, geography, and belief systems. 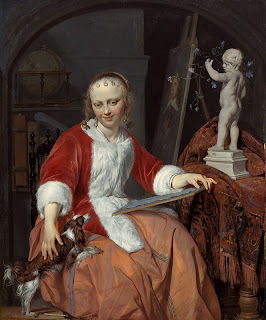 This stunning exhibit at the National Gallery of Art in Washington, DC, which had already been at the National Gallery of Ireland in Dublin, brings together more than 30 playful, delicately observant genre paintings by a 17th century Dutch master, Gabriel Metsu. Interestingly, the paintings labeled as coming from “private collections” turn out to be the ones with the more complex histories. As part of our commitment to transparency in the global art market, here is our version of the Metsu exhibit currently on view at the National Gallery of Art in Washington, DC. “A Woman writing a letter,” c. 1662-64, Oil on panel, Private Collection. According to the Munich Central Collecting Point (MCCP) Database, this painting originated in Amsterdam. It was sold by a dealer named Hartog to agents of Adolf Hitler’s Linzmuseum project. The Allies found the painting at Altaussee before returning it for processing and repatriation to Holland from the Munich collecting point. “A hunter visiting a woman at her toilet[te],”, 1661-63, Oil on panel, private collection, United States. It was processed through the MCCP and repatriated to France in September 1945 and subsequently restituted to the Rothschild family. “Le corset rouge/Red corset” or “Woman artist with red corset”, circa 1661-64, oil on panel, Private collection. "Woman Artist with Red Corset"
Who knows who the happy current anonymous owner is of this wonderful painting? What we do care about is that it also belonged to the Rothschild family in Paris, France. 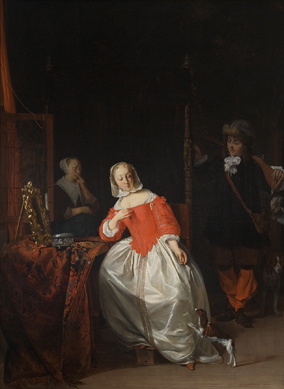 Dubbed “Die Malerin” by the ERR and labeled “R 8”, this painting suffered the same fate as that of the “Hunter visiting a woman at her toilet[te]”. But, since it had suffered some damage and was in need of restoration, the ERR sent it to Buxheim where the official ERR restorer, Otto Klein and his staff helped stabilize it. Rather than go through Munich, the painting was repatriated to France in December 1945 and restituted to the Rothschild family. 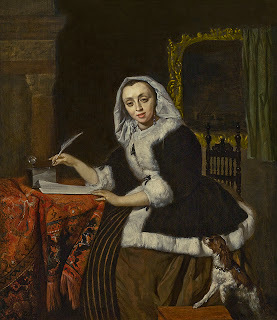 If you are in Washington, DC, please visit the Gabriel Metsu exhibit at the East Wing of the National Gallery of Art and realize, once again, that behind every work on public display lies a complex and sometimes dramatic story provoked by unpredictable turns of history. Restitution involves the act of returning a stolen object to the owner who was the victim of the theft. However, if a gallery sells a painting to a citizen of the German Reich who then takes it home across the Rhine, does that constitute theft, especially if the object itself is proven not to have been stolen in the first place? When the French claims agency, the Office des Biens et Intérêts Privés (OBIP) restituted a painting to the Selection Committee (Commission de choix) of the Louvre in December 1951, it implied that the Selection Committee and/or the Louvre had lost the painting in the first place and justice was being served by incorporating the painting into French State collections. 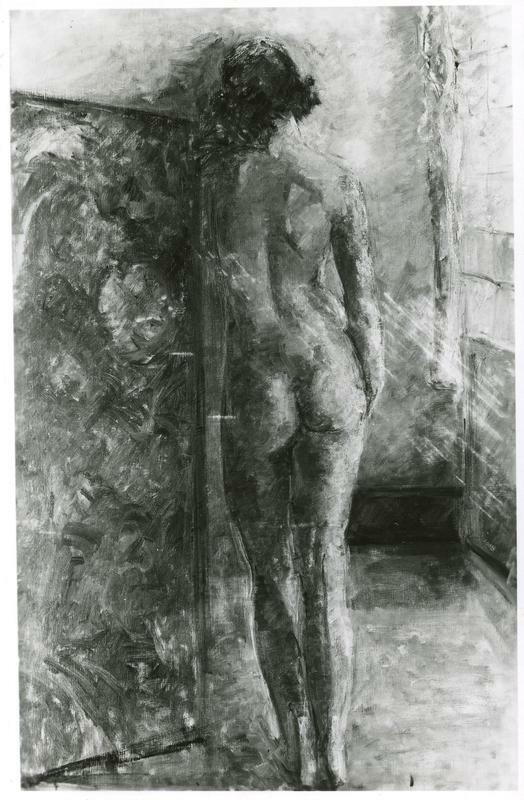 In this particular instance, the painting, “Vénus, Bacchus, Cérès, amours et saphirs”, by Frans Fioris, had been sold in 1941 to a leading German agent—Karl Haberstock--through a gallery owned by Hugo Engel in German-occupied France. Although the item had not been stolen prior to sale, the postwar French government nevertheless treated the work as a stolen object. Back in the heady days of the liberation of North Africa by Anglo-American troops and contingents of the French Resistance, the French National Liberation Committee had declared that all transactions on French territory with representatives of the Reich were deemed null and void, an act which paved the way for a complex and lopsided campaign of restitution and compensation in the years following the Liberation of France. For all intents and purposes, the act of declaring a transaction null and void conferred on the transacted object the taint of theft and illegality. Let’s pretend for a second that France had not been invaded by Nazi Germany. Hugo Engel still would have offered the Fioris painting to Karl Haberstock, a Nazi cultural agent, who then returned to the Reich with it, acting on behalf of his superiors in the Nazi hierarchy. The French government would not have objected to the sale and departure of this object from French territory. But all of that changed with the German invasion of France and the subsequent wholesale requisitions, acts of plunder and spoliation that befell those living within its borders. Now, the Fioris painting was no longer just another painting being put up for sale in a Paris gallery. It was now treated as if it belonged to France, in other words, its acquisition and transfer to Reich territory was tantamount to a forcible removal of the painting from the bosom of that organic national entity known as France. In sum, a war of aggression and conquest against France waged by Nazi Germany had transformed the privately-owned Fioris painting into a State-controlled object that earned it the full protection and consideration of the French State. A curious turn of alchemy which afforded France to lay claims in the postwar to a significant haul of art that had emanated from its private art market and been acquired by individuals who had transported their cultural purchases outside its borders into the Reich. The Allies countenanced this conversion of private commercial transactions under Nazi rule into illicit acts of property transfers, thus equating them with actual acts of plunder and misappropriation. Regardless of how one judges this policy, it has produced, among other things, an awkward category of objects known as the MNRs—Musées Nationaux Récupération. Many of the MNRs fall into the category of the Fioris painting—acquired in the open private art market during the German occupation and removed from French territory by the purchaser. The question now becomes: should the MNR’s even exist since they are as close to war booty as one can get, save for those which are, beyond a shadow of a doubt, plundered objects? The maintenance of this ambiguity forces us to consider that all objects acquired in France—fair and square—during the period of Vichy rule and German occupation—from June 1940 to the fall of 1944—should be considered as illicit transfers of property until otherwise stated. One can’t have one’s cake and eat it too, but it appears that, for the past sixty years, that is precisely what has occurred, thus casting an inexorable taint of wartime theft and illegality on an unimaginable number of cultural objects that have since made it into countless collections on both sides of the Atlantic Ocean. Or put another way, why should the famous sale of Georges Viaud's Degas collection during the Vichy years be treated any differently than the sale of the Fioris painting? If you love art and food and drink and ‘joie de vivre,’ Buenos Aires is for you. And you might even really wonder if some of it is real? Take the collection put together by María Amalia Lacroze de Fortabat which is housed in a swanky, gleaming white rectangular structure at Puerto Madero, in the toniest section of Buenos Aires, nestled next to soaring skyscrapers. On to San Telmo which probably has the highest concentration of antique shops in all of Argentina. Block after block, richly adorned stores sell all sorts of objets d’art, paintings, works on paper, odd accessories. One of the main dealers is a Mr. L., a nice old man who hails from Moldova. His family settled in Argentina over 80 years ago. 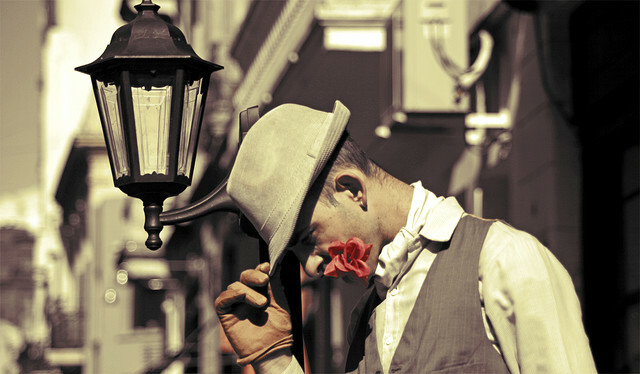 He learned the trade, hands-on, no prior interest in the arts, but he’s now one of the best in the business in Argentina. His choice pieces go straight to Miami, New York, and Los Angeles and local American auction houses are regular visitors to his corner store. So, how does he do it? Business is conducted on a handshake. You bring in the item. Mr. L. sells it. Done deal. Mr. L. was the place to come to for artisanal glass from France and particularly those items signed by legendary craftsmen like Roger Gallet. Again, no questions asked. No receipts, no inventories. Too bad if you want to produce a catalogue raisonné of works by Gallet. Argentina might not show up in the provenances. Frustrating but this is the reality of the trade: a black hole through which countless possessions can circulate anonymously, no strings attached before they reach the top-tier centers of the international art trade. An outstanding assemblage of works of art covering all periods of history, many of which entered the MNBA after 1945. The date is important because, in the decade following the end of WWII, the Museum received twice as many works as it had in the previous four decades of its existence. An unusual expansion, an explosive growth coming on the heels of world war. I’ll leave it at that. A Museum of donors with no internal cohesiveness built by a French architect for an extraordinarily wealthy businessman, Matías Errázuriz Ortúzar, so that he and his wife, Josefina de Alvear, could entertain properly. Objects cover all periods and come from Tsarist Russia, England, France, Germany and Central Europe, Spain, and only a handful from Argentina. Some notables: the death mask of the Duke of Reichstadt, or Napoleon II. Brought into the collection in 1944 by a local parliamentarian. The original is in Paris. In a glass case on the ground floor of the museum, there are several black-bordered porcelain saucers labeled as having once belonged to Moïse de Camondo. The problem here is that this particular member of the illustrious Parisian banking family of Camondo died in 1935. All of his belongings including his estate and outstanding fine and decorative arts collection were donated to the French government. The question, therefore, remains: how did these items cross the Atlantic and end up in this fine Argentine museum? The only link between Camondo and the Museo Nacional de Arte Decorativo is the architect who built it. René Sergent was Camondo’s architect. But does that explain the presence of saucers belonging to a man who was a collector, not a dealer? 5 years after Moïse de Camondo’s death, the Vichy government came to power in France and collaborated with the Nazi occupation forces. Many members of the Camondo family perished at Auschwitz. Buenos Aires, city of intrigue, brimming with life, culture, haunted by a loaded history, where Holocaust survivors, refugees of all sorts and European mass murderers co-existed for decades. An insightful commentary about Nazi looting of Polish collections by Dr. Robert Kudelsky of Warsaw serves as a stark reminder of the criminal role played by art historians in the wartime plunder of Europe. Most continued to ply their trade in the postwar era, unmolested by Allied authorities or by the governments of their own countries. 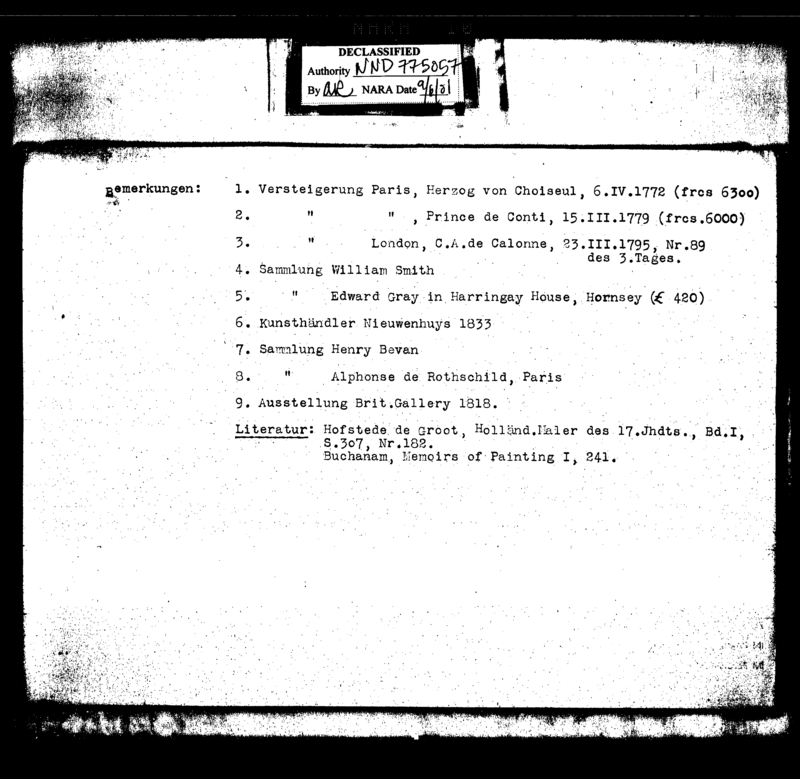 In fact, the various Allied collecting points relied on art historians who had once served the Reich for help in identifying and locating looted works of art in the various occupation zones of Germany and Austria. Let’s not forget that the Muhlmann brothers also plied their trade in the heart of Paris at the rue Mayran from which they shipped hundreds of pieces appropriated through various means in and around Paris to their paymasters in Austria. Coincidentally, the Schenker shipping company was also located… in the rue Mayran. In November 1940, Chaim Soutine’s main benefactor, Madeleine Castaing, had introduced him to the former wife of Max Ernst, Marie-Berthe Aurenche, at a café in Saint-Germain-des-Prés. Shortly after he and Aurenche left Paris to find safe refuge in the French countryside, Soutine had offered Castaing one of his paintings which she then refused to purchase. Offended at the idea that his benefactress would turn him down, Soutine issued a pronunciamento whereby she could never again purchase any future works of his under any circumstance whatsoever. Caprice? Or did he really mean it? Regardless, Madeleine Castaing continued to buy his paintings, albeit through third-parties, including his new girl-friend. Like all Jews in Vichy France, Chaim Soutine was forced to wear the Yellow Star, something that he had never dreamed would happen to him in his adopted country, France. His status as a foreign-born Jew had also earned him house arrest in Champigny-sur-Veuldre, a small town of the Indre-et-Loire in central France where he had sought refuge. Suffering for years from an ulcer condition, Soutine’s health worsened to the point where he had to seek medical attention at the risk of being arrested and deported. It did not help matters that he worked ten to twelve hour days. Unable to drive directly to Paris, he and Aurenche took several days to reach the capital where, on August 7, 1943, Soutine’s ulcer burst open. The bad boy of inter-war Expressionism in France, Chaim Soutine, died of a perforated ulcer at an operating table on August 9. The following day, on August 10, his friends buried him at the Cimetière Montparnasse. Of the 17 landscapes that he managed to execute under severe stress as a hounded Jew between 1942 and 1943, 8 ended up in “private collections”, one was acquired by Gérard Magistry, one by the Castaing family, two by the Galerie Louis Carré in Paris, one by Alain de Lesché, and one by Marie-Berthe Aurenche. Of the two Still Lifes in Soutine’s catalogue raisonné which were dated after 1940, Martin Fabiani bought one and the Galerie Louis Carré the other. What’s funny about all of this? Gérard Magistry is a lawyer and the brother of Madeleine Castaing. Alain de Lesché [Leché], a viscount and early fan of Soutine’s works, was also a first-class opportunist who dallied with the German occupiers and ended up with a rather tidy number of illegally-acquired works. 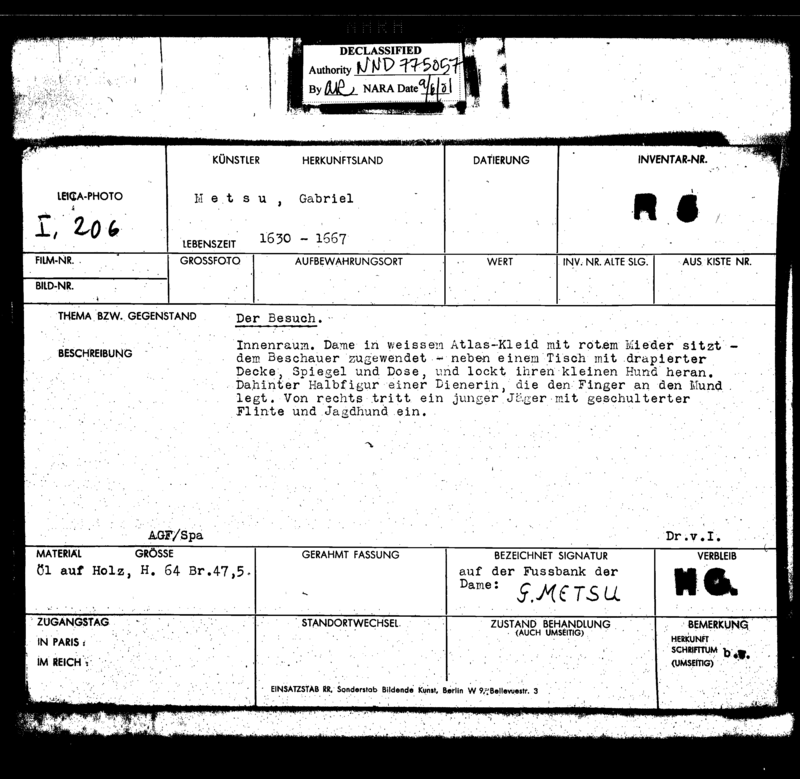 His name can be found on numerous Allied lists of art dealers and collectors friendly to the German occupiers. Marie-Berthe Aurenche, as indicated above, was the third and last girlfriend and/or companion of Soutine’s until his untimely demise. The Galerie Louis Carré, which opened its doors in 1938, remained open throughout the entire Vichy era, exhibited countless numbers of abstract painters (French and not Jewish), and, by some miracle or not, continued to do business despite the presence of German cultural hawks and Vichy watchdogs and censors. The key to this riddle lies in Marie-Berthe Aurenche. Down on her luck, emotionally unstable (ask Max Ernst what he had to go through with her), one could easily argue that she had hit the jackpot with Soutine. Moreover, a powerful and extremely resourceful business woman like Madeleine Castaing made Aurenche into an easy patsy to satisfy her tastes for Soutine’s works. Was that such a bad thing? Well, it might be if the artist was opposed to such transactions. Needless to say, Soutine died a horrible death. Shortly thereafter, Aurenche packed up his belongings. Since she was ‘Aryan,’ no one gave her a hard time. She brought the remainder of his works to Paris and proceeded to sell them. Did Soutine leave a will? If not, he died intestate. Is it true that the girlfriend of a deceased foreign-born Jewish artist inherits his works automatically upon his death in 1943? According to filial law which is the golden Napoleonic rule of inheritance, girlfriends have no rights. Hence, how did the remainder of the creative output of Chaim Soutine end up in the clutches of a highly unstable but well-connected non-Jewish mistress? Those who benefited directly from this windfall were…. Madeleine Castaing, the Galerie Louis Carré, and Marie-Berthe Aurenche. Postscript: When next you go to Paris, do visit the Cimetière Montparnasse. After you enter through the main gate on Boulevard Edgar Quinet, turn right, go to the end of the alley, turn left. Count to 10. Look to your right next to some bushes. You will see a substantial, dark-grey, moss-covered tombstone with Marie-Berthe Aurenche's name on it. On top of it, on a tiny square piece of white marble are etched the name of Chaim Soutine, his year of birth and year of death. Fitting tribute for one of France's greatest artist of the 20th century? I don't think so. The Second World War is over in Europe and North Africa. The Third Reich no longer exists. The only active military front is in Asia where the Japanese Imperial Army continues to put up fierce resistance to American-led troops. That all comes to an end with the detonation of two atomic devices, one over Hiroshima and another over Nagasaki, in early August 1945. 60 million people are known to have died as a direct result of the Second World War. This figure includes six million Jewish men, women, and children exterminated in death camps, ghettos, forests, fields, marshes, and concentration camps. It also includes at least 5 million men, women, and children of other faiths decimated in concentration camps, forced labor, in villages and cities across Axis-occupied Europe. The remainder died in the crossfire between rival armies, as victims of reprisal killings, from hunger, disease, and exposure to the elements. The victorious Allied powers set in motion policies to effect the repatriation of assets looted by the Axis to the countries from where they were forcibly removed. While laying down complex reparations formulae that leave no country satisfied, they also lay claims to assets owned by the Reich and its collaborators in countries often referred to as ‘neutral’, viz., Sweden, Spain, Portugal, Switzerland, and to a far lesser extent, Turkey, and Argentina. Restitution is often confused with repatriation, but one thing is certain, restitution can only mean one thing: return of a stolen object to its rightful owner. France and the Soviet Union argue for replacement policies—to replace objects stolen from them with objects of similar quality and value in the current possession of the defeated powers. The United States and Great Britain oppose such a move. While France continues to press for replacement into the early 1950s, the Soviet Union does not quibble over words and policies. It is busy removing untold numbers of items, equipment, and other goods from countries that the Red Army overran in its bid to defeat the Third Reich as partial payment for its losses—both infrastructural and human. One out of every three Soviet male between the ages of 17 and 45 is dead or unaccounted for at the end of the global conflict. It is fair to say that 90 per cent of all those involved in direct fashion with the cultural plunder of Europe escaped severe punishment, with the notable exception of Alfred Rosenberg and a handful of his acolytes. The rest faced mostly fines, escaped prosecution altogether, and few were tried and handed down light sentences. Every formerly occupied country in Europe busily enacts laws that restrict the ability of victims to recover items plundered by fellow citizens. Most egregious are the waivers granted to so-called third-party transactions: all individuals who were involved in brokering forced sales and illegal removals of property are granted the benefit of the doubt, lest it be explicitly proven that they knowingly handled items which had been misappropriated for racial and other reasons. Worst of all: the main proponent of postwar restitution, namely the United States, walks away from the restitution process in the early 1950s, feeling that the job was 'well done', ignoring the plight of claimants who by then have become naturalized US citizens. No one has done an accounting of the numbers of claimants who actually obtained restitution of lost items and assets. Judging by the number of victims, their surviving next of kin, the figures can only be ridiculously low--in the single percentile digits. Where are all the looted objects, aside from those which victorious armies recover by the truckloads in the aftermath of victory? items removed from Soviet territory, Hungary, Czechoslovakia, and Poland, find their way into Germany, Austria, and Switzerland. For instance, many cultural objects stolen in Poland are discovered in the French zone of Occupation in Germany, while Russian icons, books from the Ukraine and private collections from Latvia end up in various parts of Austria and Germany. 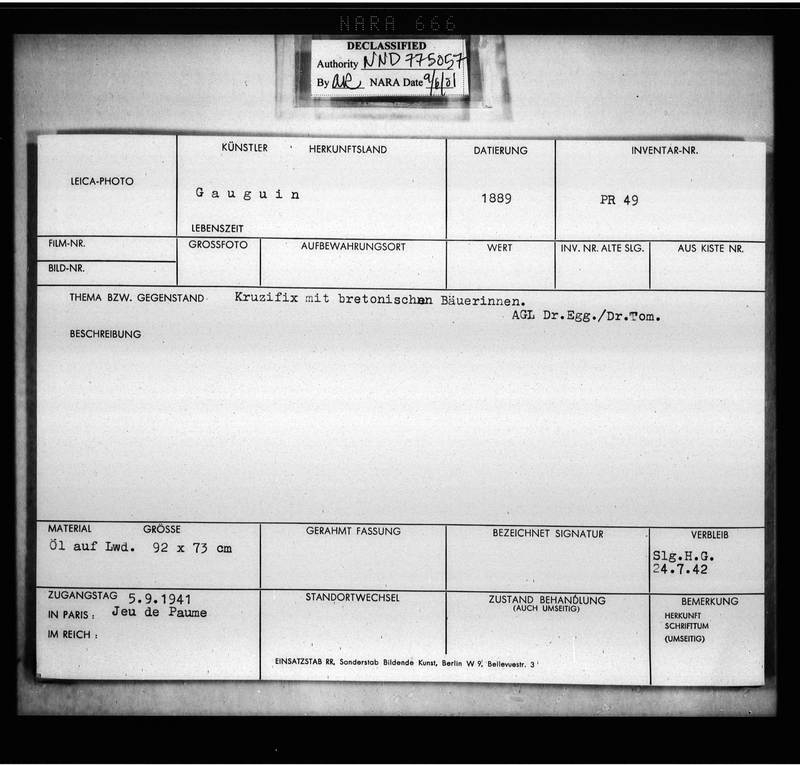 Although a percentage of those items are repatriated to the Soviet Union, the picture is unclear as to their numbers and the percentage that they represent of all items recovered by Allied forces. items from Yugoslavia enter Italy, Austria, and Switzerland. items from Italy go north to Switzerland, Germany, and Austria, as well as west to Spain and France (after August 1944). items from France, Belgium, Holland, travel to Italy, Spain, Germany, and as far as Austria and Poland, and in some cases even to German-occupied Ukraine where Belgian books looted by the ERR find a final resting place. 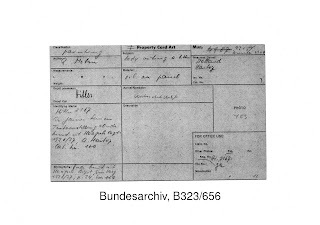 items discovered in the various zones of occupation controlled by Great Britain, the United States, France, and the Soviet Union in Germany and Austria will never be properly repatriated and/or restituted and, instead, are transferred to the territories of the occupying powers. Meanwhile, the international art market continues to thrive unabated. Art dealers and museum officials, especially in the United States, press the US military to release unclaimed items and entrust them with their sale and safekeeping since their owners are more than likely dead. Jewish relief organizations confuse recovery with rehabilitation and are quick to sell items that might be restitutable so that they can obtain quick cash, granted, to assist survivors. However, a significant number of choice items end up in libraries and collections, in Europe, North America, and Palestine, sometimes at the expense of recovering Jewish communities in liberated Europe. Plundered items infest bustling black markets across Europe; their sheer numbers make it impossible for local and Allied police and investigative agencies to intercept them. As a result, these items will slip through export restrictions and end up in collections as far away as Argentina. The residual problem of World War II and Holocaust-related plunder is a global problem since, if half of what has just been put forth is correct, looted items are to be found everywhere, both in private and government hands. If we want to resolve this question in a way that is acceptable to all parties, knowing full well that full, 100 per cent restitution was--and will never be--possible, all countries involved must come to the table and carve out a solution which allows them once and for all to close the book on one of the worst chapters of human history. Failing that, all that we have accomplished is to inform the next generation that plunder is permissible and the passage of time allows the thieves to enjoy the fruits of their mischief without fear of accountability. A classic case of being at the wrong place, at the wrong time. Edouard Esmond lived in a sumptuous apartment at 54, avenue d’Iéna, in a most exclusive part of Paris, not too far from Alma-Marceau. After the German invasion of France in May-June 1940, the new conquerors from across the Rhine set up shop in exclusive haunts---the victor’s temporary privilege until later unseated by Allied and Resistance forces some four years later. In this manner, many well-appointed addresses on the Right Bank of Paris turned into high-end offices and residences for a variety of German agencies and personalities. It so happens that, for whatever the reasons, the Einsatzstab Reichsleiter Rosenberg (ERR) under Baron von Behr, not content with its digs at the Hotel Commodore, opted to transfer their plundering operations at 54, avenue d’Iéna in October-November 1940. Expectedly, the building’s tenants were evicted, in absentia, and their belongings misappropriated by their new overseers; in particular, the apartments of Edouard Esmond and Pierre de Gunzburg. Esmond’s cardinal sin was to live at the wrong address. A born and raised horse breeder and racer, carrying on a very long and distinguished aristocratic lineage from the depths of mother England, Esmond rubbed shoulders and exchanged friendly white balls at polo with the likes of Edouard de Rothschild and ‘la famille de Gramont’ among others. His daughter, Diana Esmond, one of the first women professional golfers was also a jockey and she raced a number of horses from the Edmond stable to victory at venues such as Laversine and Deauville. Esmond’s taste in art can best be summed up as quaint and indicative of his penchants for ‘slumming’ in jazz clubs and cabarets across Paris. Most of the paintings that were removed from his apartment bore his daughter's signature and were consigned to the ideological trash heap (vernichtet) by the overzealous members of the ERR staff at the Jeu de Paume. "Portrait de peintre avec la palette"
I made two trips to Silesia—one in May 2009, focused mainly on Krakow, the other in January 2010, between Katowice and Gliwice. During the course of those two trips, I took the opportunity to do the usual gallery-hopping, museum-browsing, antique store window-shopping that is ‘de rigueur’ for my type of low-cost culture-focused tourism. Krakow, May 2009: Predictably, my eye scanned for unusual things, patterns, objects that are out of place or simply beckon for attention. And so it was, while waiting for a train at the main station of Krakow, across from the Andels Hotel, I had time to kill and needed some change. There was a bric-a-brac style antique store on the upper floor of the train station called “Galeris u adama antyki.” The room was huge—perhaps 60 feet long with 15 foot ceilings. On one side were tall windows—normal, we were in a pre-1940 train station!—and the other three walls were covered floor to ceiling with gaudy, garish, moody, dark, overdone or underdone landscapes, portraits and god-knows-what. From the corner of my eye, in the midst of this cacophony called ‘art’, a small beige abstraction in a simple tan frame caught my eye—a stand-out, a perfect anomaly hanging in the upper right corner, impossible to reach except by ladder. I asked the owner who spoke bare English whom the artist was. He told me Maria Ender. How much? The equivalent of 400 dollars in cold cash, which I did not have to spend at that point. Too bad… Saddened by my unrequited find, I later did some research into Maria Ender. She was born in Leningrad and died there in 1942 during the Siege. All I could wonder is: how did one of her “avant-garde” pieces end up in a Krakow train station antique bric-a-brac? Who knows? Katowice, late January 2010: On one of the coldest days that I could ever remember, frozen stiff, I ventured out of my hotel which was facing the historic train station of this industrial city, from which forced and slave laborers were carted off in January 1945 to destinations within the Reich and to the former Protectorate, escorted by SS guards and Vlassov soldiers. Like many cities in Silesia, the last days of German occupation left many parts of the city in ruins and the scars are obvious for all to see to remember day after day until the end of times. I headed to the “Muzeum Slaskie” on Korfantego 6, which appears not to have suffered greatly, if at all, from the late January 1945 artillery and tank pounding. I marveled at the quality of artists who plied their creative wares in pre-1940 Poland. And that’s when I saw a painting by Mojzesz Kisling, the “flower girl”, 1914-1921, and a painting by Maurycy Gottlieb, “Sulamitka,” executed in 1877. Two Jewish artists! Very impressive… I continued into a small room which turned out to be a shrine—no one would have known that except for obsessive compulsives like me who later spent hours researching dates of death of these artists… Two-thirds of the artists whose works were in this and an adjoining room had died between 1939 and 1945. Not a single mention of their fate. Embarrassment? Indifference? The same questions that gall me regarding other museums’ professed inability to share the rich and oftentimes tortured stories of works of art on display and their creators came back to haunt me on this visit. Nevertheless, it was an opportune time to contemplate these works and absorb them for what they are—testimonials to the creative breadth and energy of artists of different faiths whose talent was snuffed out during the dismembering of Poland and the suppression of those living within its borders at the time. Jadwiga Bohdanowicz-Konczewska, died in 1943—sculptress who studied in France with Antoine Bourdelle. 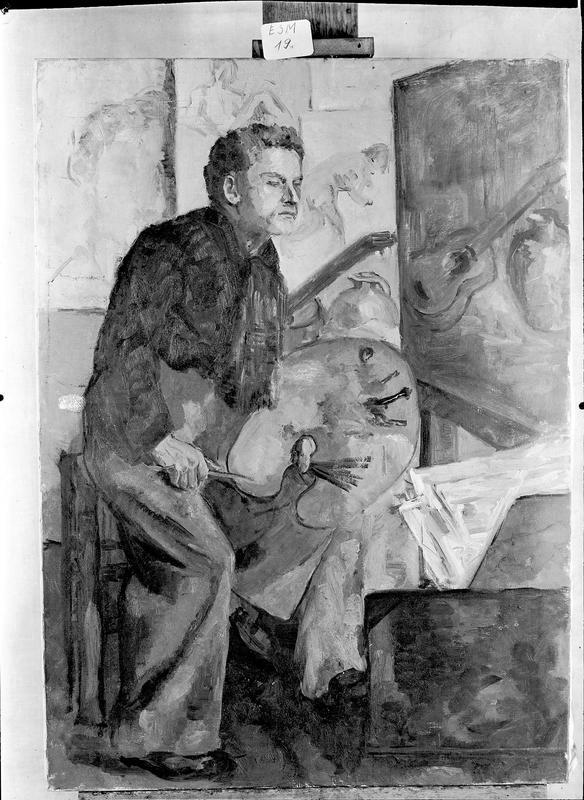 Stanislas Kamocki, died in 1944, in Zakopane.—influenced by Jacek Malczewski and Leon Wyszolkowski. Taught at an art school in the village of Poronin near Zakopane. Roman Kramsztyk, died in 1942 in the Warsaw Ghetto—qualified as a Polish Expressionist. Part of the Friends of Fine Arts Society, Krakow. Linked to Tadeus Pruszowski and Eugene Zak. Had studied in Paris before returning to his native homeland in the 1930s. Edward Okun, died in 1945. Tadeus Pruszkowski, died in 1942. 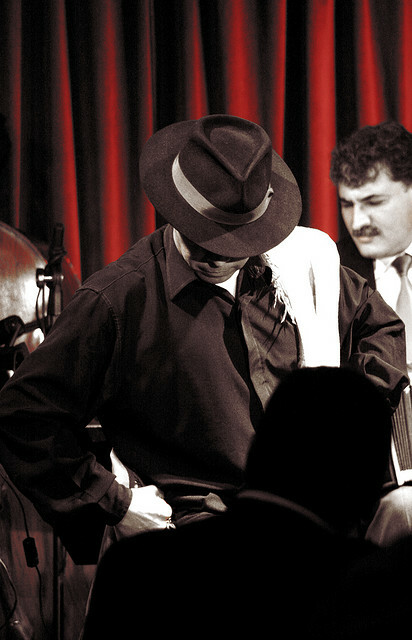 He belonged to the Warsaw School and the Fourth Group and taught at the Warsaw Academy of Fine Arts, and was a member of the Rhythm Group (1922-1932). Michal Rouba, died in Wilno in 1941.—His ‘Landscape of Mlyn, 1927’, is very much in the spirit of Soutine’s curvy landscapes. Studied in Krakow, but worked and lived in Wilno. Jan Rubczak, died on 27 May 1942 at Auschwitz—arrested by the Gestapo in April 1942 at a Krakow café with a group of artists. Henryk Szczyglinski, died in 1944, born in Lodz, died in Warsaw. Stanislaw Ignacy Witkiewicz, died in 1939. Feliks Michal Wygrzywalski, died in Rzeszow in 1944—a realist/orientalist painter trained in Munich. Kasper Zelechowski, died in 1942.—studied in Krakow. Not everyone is a fan of Paul Gauguin, myself included. But his obsessive sense of esthetics concerning exotic women (read, Tahitian) blended with mystical Catholic religiosity from his days in Brittany can produce a haunting effect on the viewer, innocent, skeptical, or not. 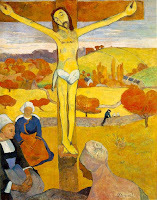 The “Yellow Christ” is one special painting and stands out as one of my favorite works on the theme of crucifixion. Unique in its rendition of Jesus on the Cross, its paganism coupled with ecstatic pain and melancholy is riveting. Even more fascinating is the history of the painting. Owned by Paul Rosenberg of Paris at least since the 1930s, the “Yellow Christ” ended up in Bordeaux for safekeeping in the face of the Nazi onslaught against Western Europe in the spring of 1940. Unfortunately, Paul Rosenberg’s collection was a highly coveted prize to unscrupulous agents of the Reich and their dealer friends in Paris. By the spring of 1941, all that could be found in various depots across southwestern France which belonged to Paul Rosenberg was conveyed to Paris and ended up at the Jeu de Paume, including a haul of works found on a cargo ship as it left Bordeaux. Gustav Rochlitz obtained the Gauguin work on the occasion of the 21st officially recorded exchange (Tausch) with the ERR staff at the Jeu de Paume. The exchange occurred on 24 July 1942. In exchange for the “Three Graces”, a lovely work attributed to the School of Fontainebleau, Rochlitz obtained the Gauguin painting (PR 49) and a painting by Henri Matisse (Unb 353). Both paintings were allegedly shipped to Rochlitz’s warehouse in Baden-Baden in June 1944. I say allegedly because, as it turns out, the Gauguin was located in Paris. Recovered and restituted in 1945, Paul Rosenberg agreed to sell it to the Albright-Knox Gallery in Buffalo, NY, in 1946. The story of the acquisition has a charming twist in that Andrew Ritchie, then director of the Albright-Knox, had been detailed as an art advisor with the US Forces European Theater (USFET) headquarters to ferret out looted collections and aid in their return to their countries of origin. Rosenberg sold the Gauguin to the Albright-Knox in recognition of Ritchie’s efforts on behalf of spoliated collectors such as himself. The other twist to this story reflects the oft glaring inadequacies of art-historical knowledge regarding artists and their creative output. These lacunae have come back to haunt claimants in their quest for restitution of items attributed to specific artists. When they are particularly famous, like Gauguin or Klimt, the stakes are even higher as the value for the work can increase exponentially. 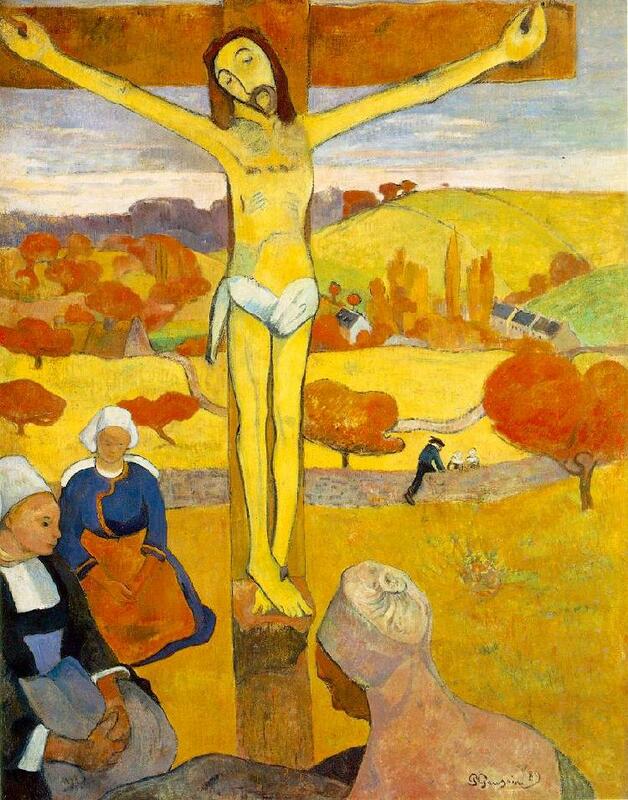 In the case of the “Yellow Christ,” very few people in the art world then and now knew of the existence of a smaller version of the iconic painting. The infamous art book publisher, Albert Skira, whose wartime activities have been less than honest, spread a rumor in spring of 1945 to the effect that Rosenberg’s painting was sitting in a bank safe in Geneva, Switzerland. The Office of Strategic Services (OSS) launched an investigation in Switzerland and contacted a Gauguin expert, Dr. Lucas Lichtenban who worked at the Basler Kunsthalle. He reported that, indeed, there was a very small work on panel depicting the Yellow Christ (measuring 8 x 5 cm!) which had been in his Basel gallery back in 1928 and was sold to a London concern, Brown and Phillips, in 1932. 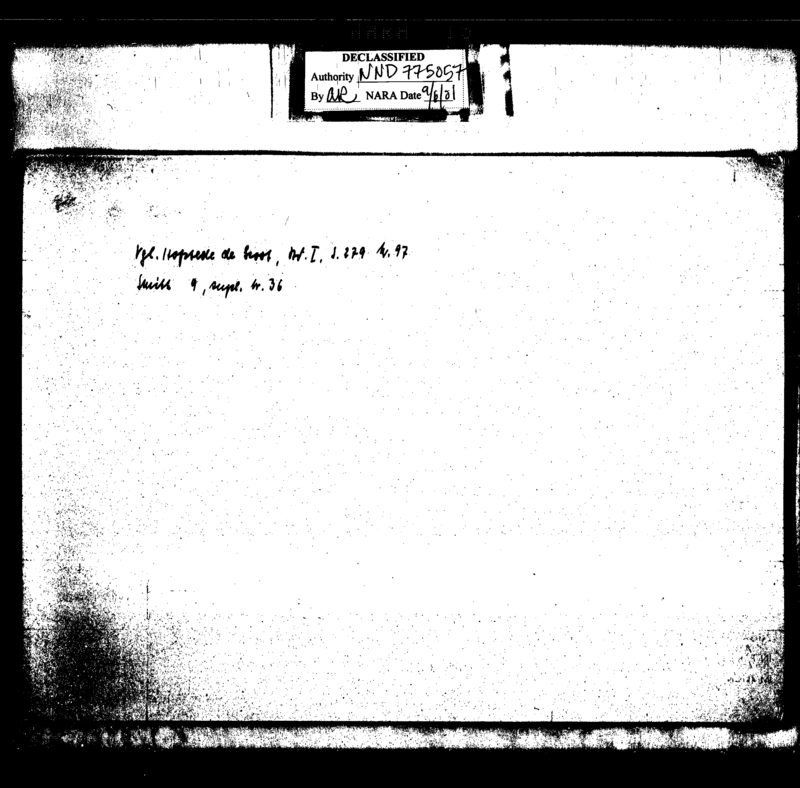 However, OSS wanted to make sure that there was no link to Paul Rosenberg and the inquest went on, in vain. Back to the National Gallery of Art in Washington, DC. If you go see the Gauguin exhibit before June 5, 2011, please do so and linger in front of the “Yellow Christ.” Soak it in and ask yourself why on earth there is no explanatory text next to the painting which reflects its extraordinary saga through wartime France and its happy ending at the hands of the Albright-Knox in Buffalo, NY. Transparency does not require much effort, or does it? You can never be too careful. Thanks to the watchful eye of a museum curator in Indiana, the information in the Jeu de Paume database concerning the thefts in 1941 of Raoul Meyer’s collection from a safe in Mont-de-Marsan required a serious overhaul. The painting entered the Jeu de Paume on February 2, 1941. 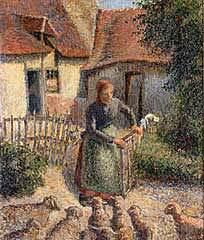 The most egregious mistake was to have indicated as restituted a painting by Claude Pissarro, “La Bergère,” a small work which, as it turns out, hangs currently in the Fred Jones Museum of Norman, Oklahoma. There is no evidence that the painting was ever returned to Raoul Meyer as of 1947. The subject of one of numerous exchanges engineered by the likes of Gustav Rochlitz, the painting most likely ended up on the private art market in Switzerland from which it wended its way to the United States. In fact, thanks to Swiss Federal documents, additional light can be shed on the fate of Meyer 13, or "La bergère rentrant ses moutons," by Claude Pissarro. Indeed, in a confidential report filed on March 6, 1998, by Pablo Crivelli of the Independent Committee of Experts on Switzerland during the Second World War (Commission indépendante d’experts: Suisse-Deuxième Guerre Mondiale), Crivelli details the difficulties in reconciling the evidence of plunder aimed at the Pissarro painting stolen from Raoul Meyer and the sparse documentation in the possession of the Swiss Compensation Office (Office Suisse de Compensation) at the time that the loss was declared to the Swiss government. 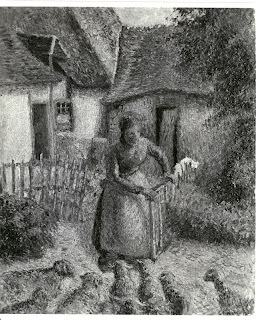 Unbeknownst to Raoul Meyer and his lawyers, the Swiss Compensation Office (SCO) receives a tip that a man named Léon de Sépibus, who already enjoyed an unsavory reputation among Swiss commercial circles, had imported two paintings into Switzerland in late 1945, one of which was the Pissarro. 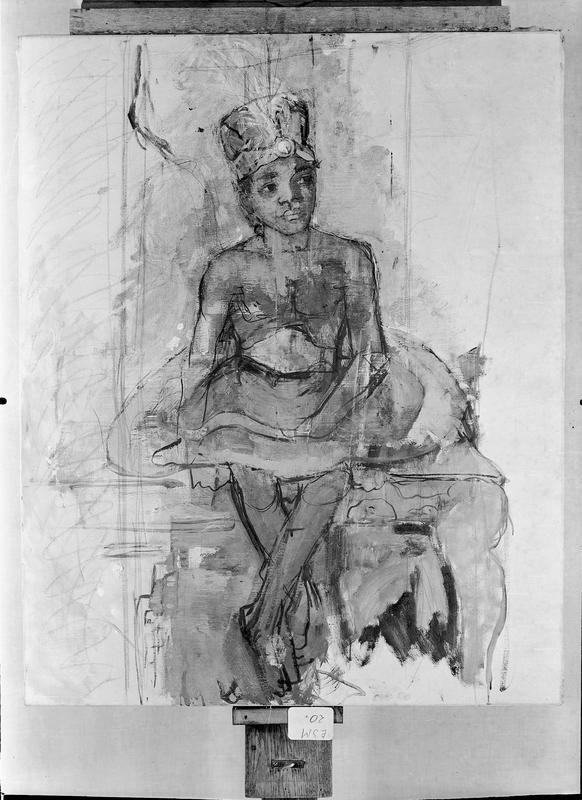 The SCO wrote several letters to de Sépibus asking him for information about the paintings and official documentation regarding their origin. According to SCO officials, de Sépibus panicked, replied that he had re-exported the paintings to the United States shortly after their arrival in Switzerland. Nevertheless, SCO staffers had recorded the two paintings imported by de Sépibus as worthy of additional inquiry. It was not until spring of 1947 that the French Embassy in Bern began circulating to dozens of Swiss entities the French government's official listing of works and objects of art looted during the period of German occupation of France, also known as the "Répertoire des Biens Spoliés." Hence, in theory, the SCO could not have known prior to spring of 1947 that the Pissarro in the hands of de Sépibus might have been the Meyer painting stolen in France in early 1941. The entire case burst forth into the open when Raoul Meyer files two lawsuits in 1952, one against de Sépibus and the other against a Swiss art dealer, Cristoph Bernoulli, who is identified as the current owner of the Pissarro painting. The case dragged on well into 1953, where the SCO denied knowing anything of the looted nature of the painting, while Bernoulli argued his good faith regarding the Meyer painting. It transpires that no one had questioned de Sépibus about discrepancies in his story as well as contacting the French Embassy in Bern in 1946 about the possible looted origin of the Pissarro in the hands of de Sépibus. One way or another, the Swiss experts were not given access to the court records pertaining to the separate Raoul Meyer proceedings against Bernoulli and de Sépibus. Hence, the shroud of uncertainty continues to hover over this small painting currently on display at the Fred Jones Museum in Norman, OK. The correction to the Pissarro Meyer have required a complete review of this small but important collection of modernist works held by a man who co-owned with Max Heilbronn, another victim of the ERR’s plundering units, the famed ‘Galeries Lafayette’ department store on the right bank of Paris. The Meyer case becomes more complicated due to a single work—a painting by Amédéo Modigliani entitled ‘La Porteuse de pain’. 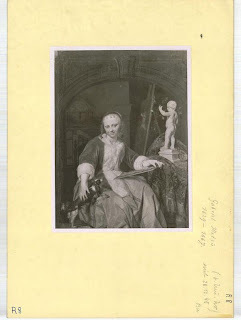 It shows up on several lists referred to as the ‘collection of Raoul Meyer’ dated April 1945 which serve as reference for the French restitution authorities at the Commission de recuperation artistique (CRA). There is no correspondence, there are no signatures, hence it is unclear who compiled the list. 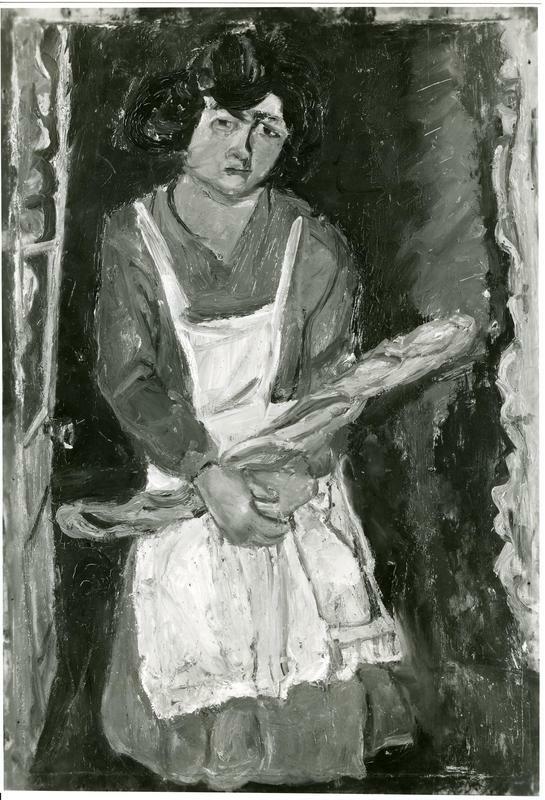 The Jeu de Paume database identifies a painting as ‘Frau mit Brot’ with the designator Meyer 9. The ERR inventory does not assign an artist to that painting. 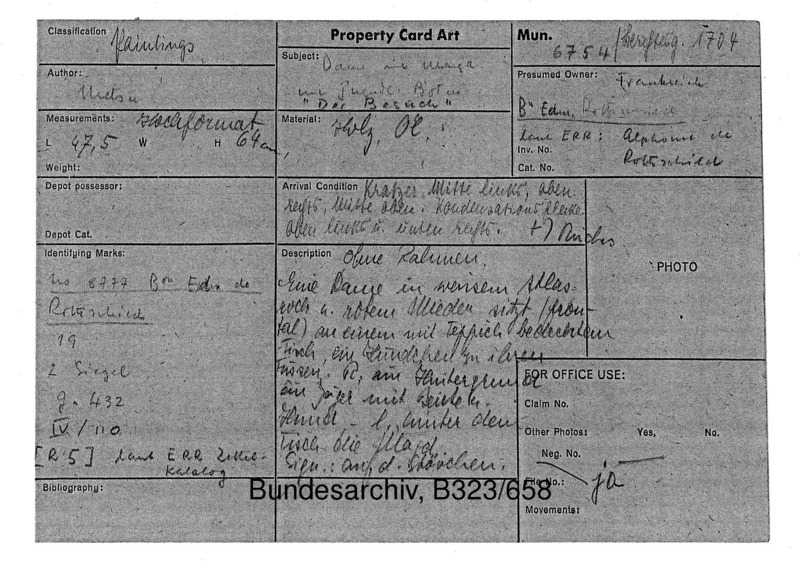 However, a handwritten note most likely placed by postwar German authorities ascribes the painting to Modigliani. 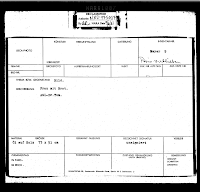 Thus, one can surmise that this addition to the ERR inventory can be explained by the fact that the Raoul Meyer list was sent to the German restitution authorities. Here’s the problem. The image linked in the Jeu de Paume database to the alleged Modigliani is not a painting by Modigliani, but it is by Chaim Soutine. It is a sister painting to his famous “Servante en bleu” which he painted in 1934. A quick check of the Soutine catalogue raisonné does not disclose the existence of the painting mis-attributed to Modigliani. 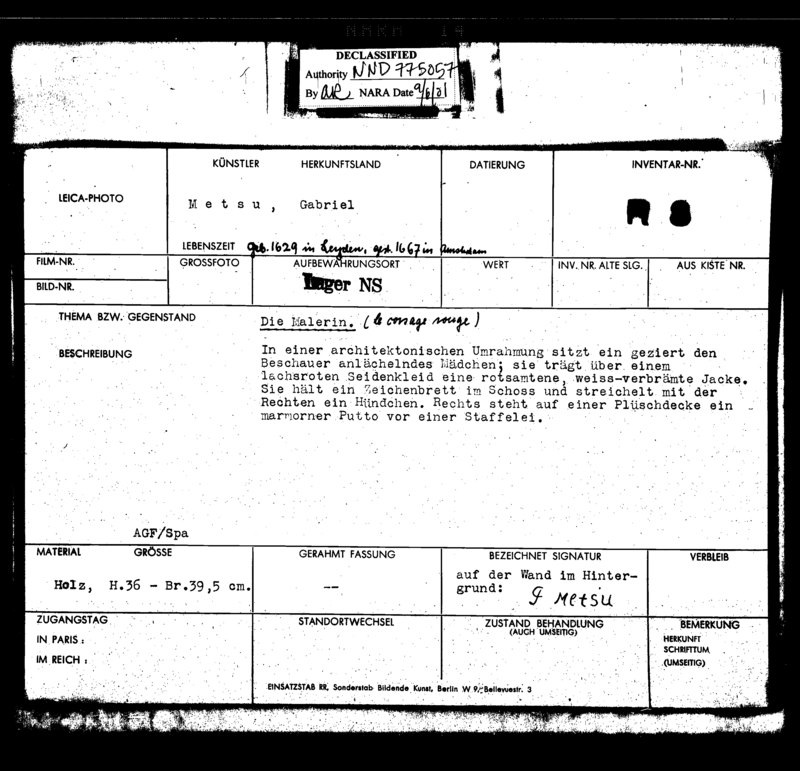 The photo comes from the Koblenz archives in Germany and is tagged as Meyer 9. It would be easy to blame an archivist for not knowing the difference between a Soutine and a Modigliani, like apples and oranges. 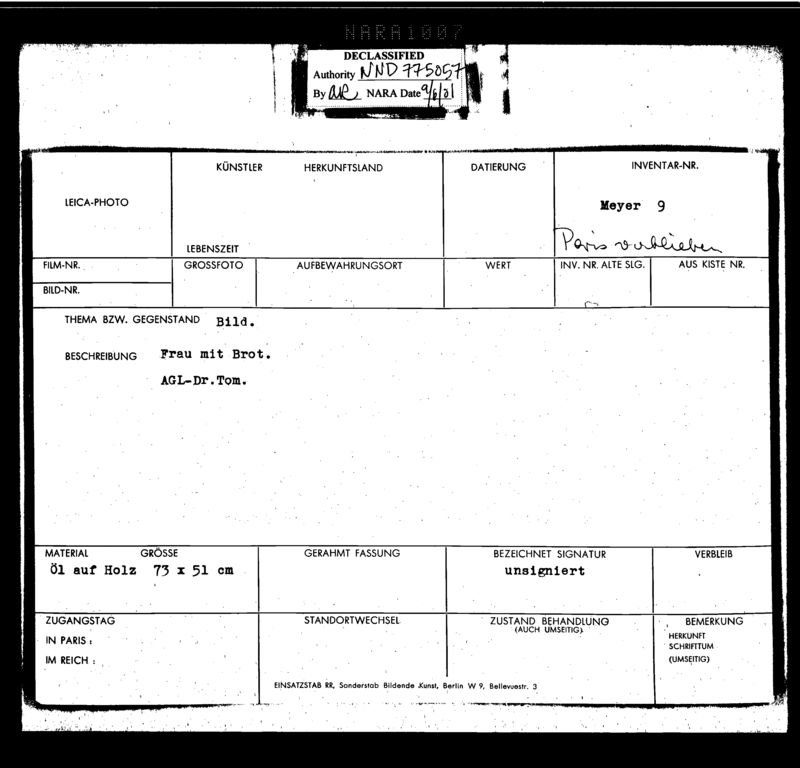 But to see the error reproduced on a quasi-official inventory of the Raoul Meyer collection is perplexing at best. Thus, we are left wondering whether the alleged Modigliani which is in reality a Soutine is truly a painting that belongs to Raoul Meyer. If it is, let’s suppose for one nanosecond that he did own a Modigliani, did Modigliani paint a woman holding a loaf of bread? If anyone out there is a Modigliani expert, please express yourself. This is the time to do it! A “fair and just settlement” for a looted Schiele in Vienna? Any public announcement of a settlement of a claim against the Leopold Museum in Vienna, Austria, must be greeted with a hefty dose of skepticism. 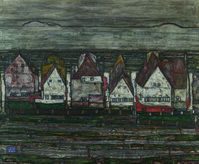 In the latest round, on the heels of the so-called return to the Leopold Foundation of the “Portrait of Wally” by Egon Schiele for a toll fee of $19 million dollars, another issue has cropped up involving “Houses by the Sea”, painted by Egon Schiele in 1914. According to today’s press reports, Dr. Rudolph Leopold had acquired the painting in 1955 after its illegal seizure from Jenny Steiner and subsequent sale by Nazi authorities in wartime Vienna. As in the case of the “Portrait of Wally,” Leopold had a tendency to be fully cognizant of the tainted past of his Schiele acquisitions without paying due heed to the moral implications of his acts, in the name of garnering in a fantastically egotistical manner the largest collection of works by Schiele in the world. 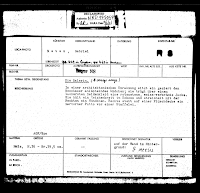 He achieved his goal, playing fast and loose with Jewish victims’ losses and with History, the history of spoliation of an entire class of citizens in post-Anschluss Austria. The “partial” settlement reached by Dietmar Leopold, Rudolph’s son, grants $5 million to Jenny Steiner’s grand-daughter, for a third of the painting. There remains the question of settling with the unnamed “US institutions” that account for the remaining interest in the painting. Although Dietmar Leopold is confident that he will be able to settle all outstanding claims against his parents’ vast Schiele collection, one must pause at the disquieting notion that such an idea is good and represents “a fair and just” reflection of the actual circumstances underlying the presence of tainted works in the Leopold Foundation’s permanent collection. More troublesome is the press release of the Leopold Foundation. Absent are comments from Jenny Steiner’s grand-daughter. Her silence is deafening. And yet, the Foundation ecstatically thanks her for her “willingness to contribute to this favorable solution.” Moreover, the very same people who refused to return the “Portrait of Wally” to the Bondy heirs for over four decades laud the personal involvement of Frau Leopold and her son to resolve these complex matters and reach a “fair and just solution.” Even more reprehensible is the declaration that the painting is “doubtlessly the property of the Leopold Museum Private Foundation.” Another way of rubbing salt in the wound. Maybe, theft does convey title in Austria, which it does not in the United States. 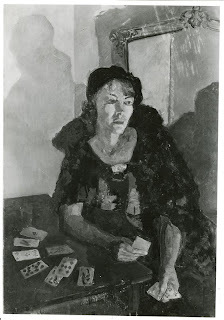 As some have pointed out recently, it strikes one as odd that a painting cannot be restituted to the rightful owner’s heir while another painting can be so easily removed from the walls of the Leopold Foundation and be offered up for sale at Sotheby’s so as to pay for the settlement of yet another painting, namely the “Portrait of Wally.” All of this smacks of the same kind of cruel cynicism that tortured and demeaned the Bondy family throughout the postwar years and into the final weeks of the settlement last July 2010. A sad commentary on the current state of affairs in Vienna. One would have thought that the Austrian government could have taken a greater role in ensuring that justice might prevail once and for all, especially after Rudolph Leopold’s death. By its own admission, the Austrian government can intervene and exert significant influence on decisions made by the Leopold Foundation, especially those that engage its fiduciary responsibilities. And yet, it does not. Perhaps, nothing much has changed after all in Vienna. 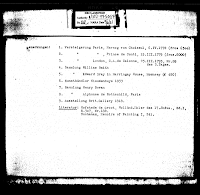 Any provenance work pertaining to works and objects of art entering or leaving Italy during and after the Nazi era must cast a pall of suspicion on the following individuals who traded occasionally or frequently with Hermann Goering through two of his principal agents, Walther Hofer and Josef Angerer. Joseph Angerer, who swept through French Jewish collections in Paris during the summer of 1940 on Goering’s account, also acquired works in Rome while he stayed at the Hotel Excelsior there. Some items—tapestries mostly—were purchased from American or British owners living in Rome at the time. Angerer was also well acquainted in Florence with Contini and Bellini, and befriended Grassi there. He knew the city of Milan like the back of his hand. 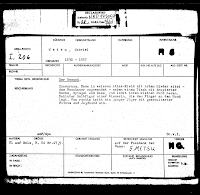 The bulk of this information stems from detailed postwar interrogations and debriefings of Walther Hofer. Conte Contini--Sometimes, Contini dealt with Goering through Reber, one of Hofer’s oldest friends who lived in Switzerland, using the Rome-based shipping company, Martelli and Rosoni. Eldebaudo Bossi--Bossi also dealt with Jacques Dubourg, a Paris dealer who was very busy during the Vichy years. 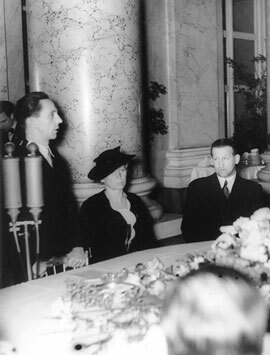 Dubourg served as a go-between for Hofer for sales to Goering. Dr. Ettore Sestieri, art historian, director of Galleria Barberini. Renewed attention is being given to the scope and breadth of objects of art plundered by the Nazis and their allies which entered the art market in Italy during the fateful years of the Third Reich and beyond. An upcoming seminar to be held in Milan on June 23, 2011, is being co-sponsored by the global auction house, Christie’s, and the Art Law Commission of the Union Internationale des Avocats (UIA). It will bring together international specialists and lawyers adept at working on art restitution cases including the New York law firm of Herrick, Feinstein, and the Commission on Art Recovery (CAR). The goal is to paint a broad picture of the state of affairs in postwar Italy regarding the restitution of Holocaust-era looted art, what can be done about improving the climate of restitution in a country that has long prided itself for having taken the lead in the search for and recovery of works of art forcibly removed from its territory. Successive Italian governments—and there have been a great many of them!—have focused their attention almost exclusively on the plunder initiated by Nazi Germany when it sent its troops deep into Italy after the removal of Mussolini in 1943. Hence, the official window of plunder in Italy has always been considered to be a ‘foreign’ affair, the responsibility for which must be laid at Germany’s feet between 1943 and 1945. Moreover, in a cynical move to prevent plundered art from leaving the country, the Italian government appears to be commingling all plundered art as 'cultural property.' Should that be the case, this signals an ominous turn against the possibility of recovering Holocaust-era cultural goods found in Italy. Once upon a time, back in 1922, there was a man by the name of Benito Mussolini whose March on Rome heralded the rise to power of Fascism which lasted a good 21 years, not bad for a political novice and former newspaper editor. During that time frame, the Fascist Party ran amok against its opponents, harassing them, arresting them, imprisoning them, and when it deemed fit, murdering them “while trying to escape.” Many others were forced into exile or confined to the ‘villeggiatura’, a semblance of house arrest in the deep rural south of Italy for anti-Fascist intellectuals. All the while, opponents’ property was seized, stolen, and reincorporated into the economy of Fascist Italy, if it didn’t end up in the homes of prominent Fascist dignitaries. In 1938, the Fascist government edicts the so-called “Manifesto of Race” which defines who is a Jew, aping the Nazi government and foreshadowing Vichy’s contribution to anti-Semitic legislations by two years. From that time on, Jews are no longer safe in Italy, nor is their property. Hence, the questions that should be asked at this seminar bear especially on the 21 years of Fascist rule, which include 5 years of pre-Nazi invasion anti-Jewish persecution. Italy remained an open market, regardless of Fascist strictures, importing and exporting and doing business with countries around the globe. The Italian art world continued to maintain good relations with its neighbors, buying, selling, and trading. As it turns out, Italy was a convenient place for Nazi dealers and museum officials to meet up with their counterparts in Italy and from other countries. During the height of the anti-Jewish persecutions in German-occupied Europe, Italian art dealers were more than happy to accept as payment, in lieu of cash, works of art which Nazi officials did not deem suitable for their collections, especially modernists. Where did those works go? As importantly, Northern Italy was a hotbed of smuggling and contraband of all manners of commodities, including art, during the period of German occupation, activities often supervised by Nazi intelligence operatives, the most notorious being Freddy Schwend, based in Merano. And one should not forget the Vatican, which curried favor to all sorts of authoritarian, racialist regimes in the 1930s and 1940s, enabling safe passage in the late 1940s and 1950s for untold numbers of Axis collaborators and plunderers on their journeys across the Mediterranean Sea and into the Americas, under the pretext that they had solid anti-Communist credentials.